An interview with the inventor of the Thought Leadership Index™ shines a light on measurable results for content marketing. If it can’t be measured, does it exist? Ah, the existential side of content marketing. Let’s be honest, we know when content marketing works, in the way ancient people knew (but couldn’t prove with their sundials) that lots of rain meant lush crops and full bellies. So too, we know—intuitively, anecdotally, by tracking indicators like time spent and shares—when quality content marketing delivers on business goals. And when it doesn’t. But how do we prove this? Hello, holy grail. The search for measurement has forever vexed our industry. And it’s even harder to track and quantify when the content marketing goal is, as is often the case for B2B initiatives, thought leadership. B2B’s content has the added challenge of communicating often complex information that must open minds, close deals and support a longer consideration cycle. The quest for quantification kept James Meyers, founder, president and CEO of Imagination (and my boss), awake many a night last year. How to create a real-deal measurement system that our industry trusts and relies on to benchmark thought leadership content? It must be rigorous, impartial, quantitative and qualitative. The answer was the Thought Leadership Index™ (TLI), launched in 2018. This proprietary annual benchmark combines third-party data and an independent qualitative survey to track five crucial data sets: Trust; Authority; Expertise and Foresight; Visibility; and Content Leadership. Last fall, Meyers worked with a cross-discipline team of strategy and content marketing experts and later reviewed and consulted with the Northwestern Medill IMC Spiegel Digital & Database Research Center to create the final model. I recently sat down with Meyers to investigate how the index works and its benefits. First things first: How do you define thought leadership? I think of thought leadership as the ability to lead and contribute to conversations by providing expertise, clarity and context to topics of common interest, thereby inspiring and influencing action in a measurable way. 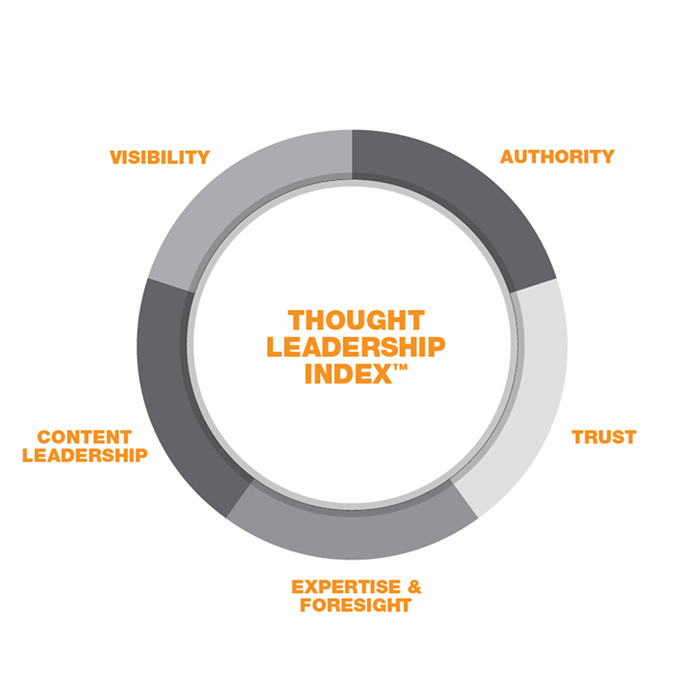 Thought leadership cannot be achieved without authority, trust and foresight, which is why these are key to the index. Are the index’s five components the same for all verticals, or do they change for each thought leadership program’s audience goals? The pillars will be common for all organizations. The weighting will change depending on the organization, and certainly some of the metrics that go into that as we build out the model will change as well. There will be core metrics that are common to all organizations, but if the company has some unique measurement programs or has done analysis in the past that speaks directly to one of those five pillars, we would incorporate that into the equation on an ongoing basis. How does the qualitative survey, a defining part of the index, work? One of the key components of the measurement is a direct, third-party research study that measures target audiences’ perceptions of these five pillars and of the organization. That will heavily influence the index because it is primary research that is direct feedback from target audiences. How do brands use the index’s findings in their content marketing decisions? There are two benefits of the index. First, it validates the return on investment the company is making in a content marketing program. From a budgetary and financial standpoint, it provides another piece of ammunition as to whether the program is successful and whether the business should further increase its content investment. Second, by looking at the five pillars and reviewing what the company is doing in its content marketing program, we can see whether one of those pillars is deficient. If the business has strong authority and strong trust but is really not creating enough content to satisfy the needs of its audience, perhaps it’s lacking in content leadership. Or perhaps it’s the brand’s visibility investment that needs recalibrating. As part of the index, we’ll also look at how the company compares to one or more of its competitors: Is it as trusted? Does it have the perceived expertise? Does its target audience consider it the thought leader? If not, then how can a content marketing program build that up in the year ahead? So, it helps the business fine-tune its content marketing program based on its TLI score. How do you foresee forward-looking brands using their TLI results? Content marketing is usually only part of their marketing and communications mix, so it certainly could give them insight into how they need to change or align their messaging for their advertising programs or public relations program. Brands can use the measures to rethink other parts of their businesses, their sales organizations, their marketing programs, their communications programs. You know, oftentimes it’s easy for a C-level executive to assume that they’re thought leaders, but is that really the perception of the people they want to reach? And more and more companies are realizing that their own employee base is an important audience for them as well. So we can also use the TLI to measure whether their employees believe they are thought leaders compared to their competitors. Who would the TLI not be good for? The more a company is focused on the long-term future and building a position of strength for the company, the more likely it is that the TLI is the right thing for it. Brands that are focused on short-term results or do not have a long-term objective of being seen as a thought leader probably would not invest in the index. They’re typically more focused on what we call campaign marketing. If thought leadership isn’t something the brand has set as a primary goal, then the TLI is a metric that wouldn’t have a great deal of value. Will the TLI solve content marketing’s holy-grail search for measurement? I don’t know if it will solve it, but it certainly moves it ahead. For the first time, it is an opportunity to look at the impact of content marketing on a company’s thought leadership position on a year-to-year basis, and that is something that hasn’t been done before. Would you like to receive more b2b content smarts each month?